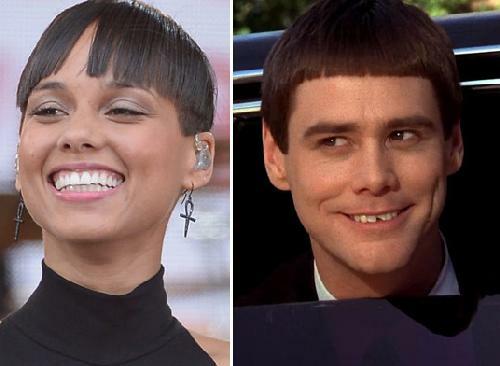 Are You Feeling Alicia Keys’ ‘Spock,’ ‘Moe,’ ‘Dumb & Dumber’ (Hair) Cut? As you’ve probably seen by now, Alicia Keys recently unveiled a new, shorter hair style. At least for a minute she did. The award winning singer revealed her new look this past Friday when she appeared on the “Good Morning America” Concert Series stage, sporting a super short pixie cut. However, she did give advance warning by saying back in December that she planned to cut her even shorter. Well she did and now we see the result. Maybe Alicia got the message ’cause, as the Huffington Post pointed out, she tweeted another pic showing her hair in a different style and praising its “versatility.” She also added “love and light to u!” Hmm, is that a message to some body? A.Keys needs a stylist ASAP! No, I’m not feeling anything you suggested but I am feeling her beautiful new cut and that beautiful smile. She’s the best! Eur, you’re just a typical “a woman without long hair, is an ugly woman” person. SAD you are so narrow minded and need to degrade others to feel good.